The following diagram shows the practical three phase diode bridge rectfier. Figure 6. Three phase diode bridge rectifier. A filter capacitor is connected to the dc side of the rectifier. The supply side transmission line is represented by the R and L in series. It is not very difficult to understand the operation of this circuit. The diodes are numbered according to the sequence in which they begin to conduct. Out of the diodes 1, 3 and 5 with common cathode connections, the diode connected to the highest positive phase voltage would conduct. Similarly, out of the diodes 2,4 and 6, with common anode connections, the diode connected to the most negative phase voltage would conduct. If the three phase voltage waveforms are drawn and examined, it will be easily seen that the diodes conduct in the sequence 1,2,3�and so on. Each diode conducts for 120 degrees per cycle, and a new diode begins to conduct after a 60 degree interval. 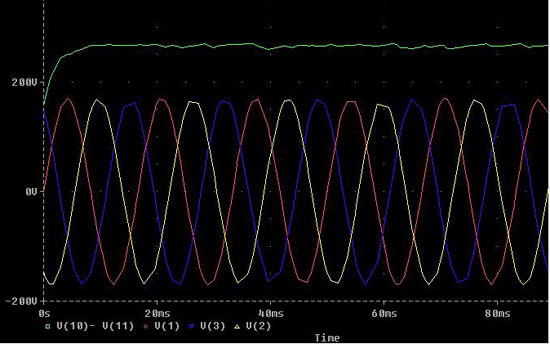 The output waveform, Vd, which consists of portions of the line-to-line ac voltage waveforms, repeats with a 60 degree interval making it a six-pulse rectifier. Figure 7. Three-phase diode bridge rectifier with nodes numbered for Pspice. The same diode model developed for the single phase rectifier has been used here as well. The rest of the codes are straight forward. To overcome convergence problem, some initial conditions have been assigned to the inductor current and capacitor voltage. *load resistance and smoothing capacitor. Figure 8. 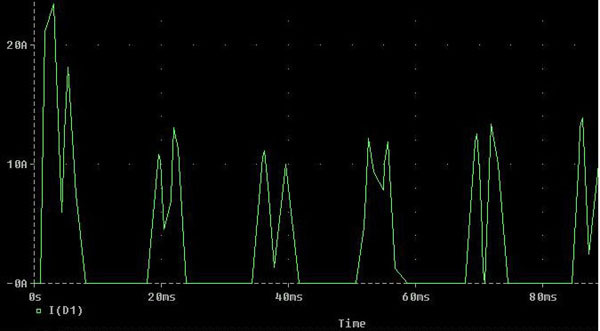 Output voltage compared with the 3-phase input voltage. Figure 8. Current through diode D1. Figure 9. Current drawn from phase voltage V1 compared with the current drawn by the load resistor. Figure 7 shows the output voltage compared with the input three phase voltages. By theory, we expect a six-pulse dc output. But here, the output is nearly a straight line. This is because of the effect of the filter capacitor that have been used. 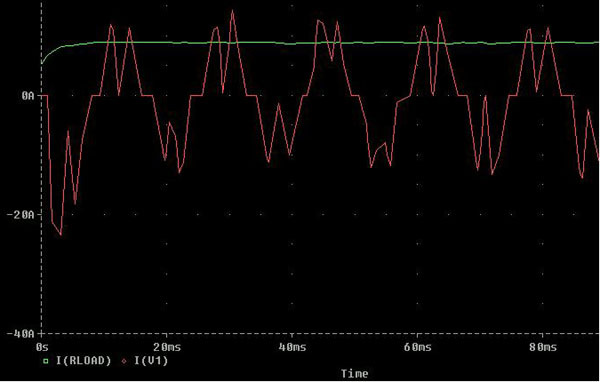 As expected, Figure 8 shows that a diode conducts for 120 degrees per cycle or per one period. Like the output voltage, the output current is also almost straight dc, while the shape of the current drawn from a phase voltage results from the different conduction cycles of the diodes.